Car2Go, the prominent car-sharing company that claims 80,000 users in Toronto, will stop operations in the city on May 31, it announced Thursday. Car2Go, the prominent car-sharing company that claims 80,000 users in Toronto, will stop operations in the city on May 31, it announced Thursday in a release. The company blames city hall, saying a new free-floating car-sharing pilot program passed by council in April after months of debate is overly restrictive and renders its service "inoperable." Specifically, it called the parking permit fees of about $1,500 per vehicle "unprecedented." 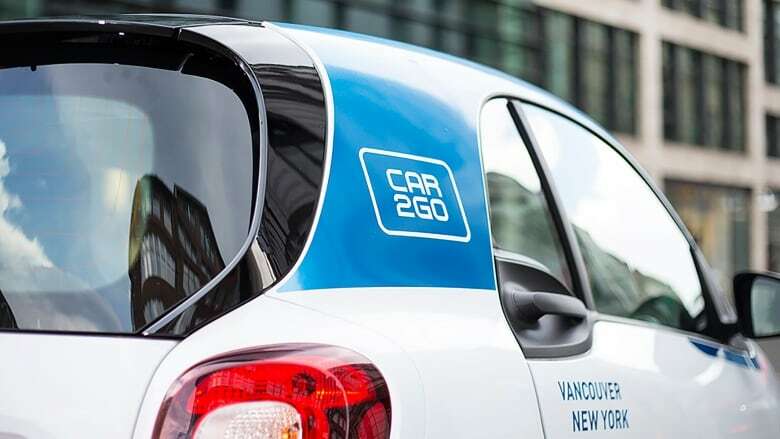 "City councillors have passed a heavily restricted pilot that ultimately weakens mobility options for Torontonians," said Car2Go North America chief executive Paul DeLong in the release. The company estimates it has 80,000 users in the city. Those customers received an email about the shutdown on Thursday morning. A company spokesperson said in an email that customers may find fewer vehicles available in the days leading up to the shutdown. In the wake of the announcement, Coun. Mike Layton presented an urgent motion at city council to ask city staff to hold further consultations with Car2Go and the car-sharing industry and report back on potential changes to the pilot in June. That passed 34-4, although there's no guarantee councillors will modify the rules they just approved. Car2Go wanted users to be able to park its 350 shared vehicles — Car2Go is well-known for its fleet of blue-and-white Smart cars and some Mercedes Benz vehicles — in residential areas. When it launched, Car2Go vehicles parked in the city's Green P lots. However, the company then instructed its customers to park in any legal space, including in residential areas. That angered some Torontonians — especially those living in neighbourhoods where on-street parking is already scarce — as well as a number of city councillors. Car2Go says council's new rules would put nearly 10,000 parking spaces off-limits for its customers. Mayor John Tory issued an email statement accusing Car2Go of choosing "confrontation over collaboration with city council." "While their decision to suspend operations in Toronto is unfortunate, it is their decision alone to walk away from a clear path toward regulations that would allow them to operate in our city in a reasonable, compatible way." Tory said car-sharing companies have the power to change how people get around the city, but their needs must be balanced with those of home owners who are finding it difficult to park in some neighbourhoods. Coun. Gord Perks previously called the company a "scofflaw," and blasted its move of ignoring parking regulations. In 2017, the company was ticketed for 42,595 infractions, which amounts to more than $1 million in fines. However, a number of councillors, including Coun. Ana Bailao, voiced support for the company, suggesting car-sharing is key to alleviating traffic congestion in Toronto. Bailao, who supported a less-restrictive set of regulations for car-sharing, called this development "very disappointing." More than 40 per cent of city council, including Tory, missed the final vote on the car-sharing pilot project. Stefan Petersen, a 23-year-old who lives in the west end of downtown, said he's been using the service for more than a year now and that it's allowed him to get by without a car. "I used it to buy a dining room table for my apartment, transport my partner and me to doctor's appointments when the TTC wasn't fast enough, and explore the city," he said in an email to CBC Toronto. Petersen said that while there are other car-sharing companies, Car2Go was the easiest and most affordable in his experience. "I'm pretty upset they'll be leaving," he said. Other Car2Go users expressed disappointment and frustration on Twitter. Toronto is still served by a number of other car-sharing companies. ZipCar issued a release highlighting its efforts to scale up its fleet to 600 vehicles throughout the city, while Communauto, a Montreal-based company, says it will soon begin operating in Toronto as well. Car2Go's service only operated in Toronto's downtown core. The company says it plans to move its vehicles to other Canadian cities. It operates in Vancouver, Calgary and Montreal. Car2Go is an arm of Daimler, the major automaker. Car2Go also announced Thursday that it's stopping service in Columbus, Ohio. The company says it's leaving that city because of a lack of people using the service.